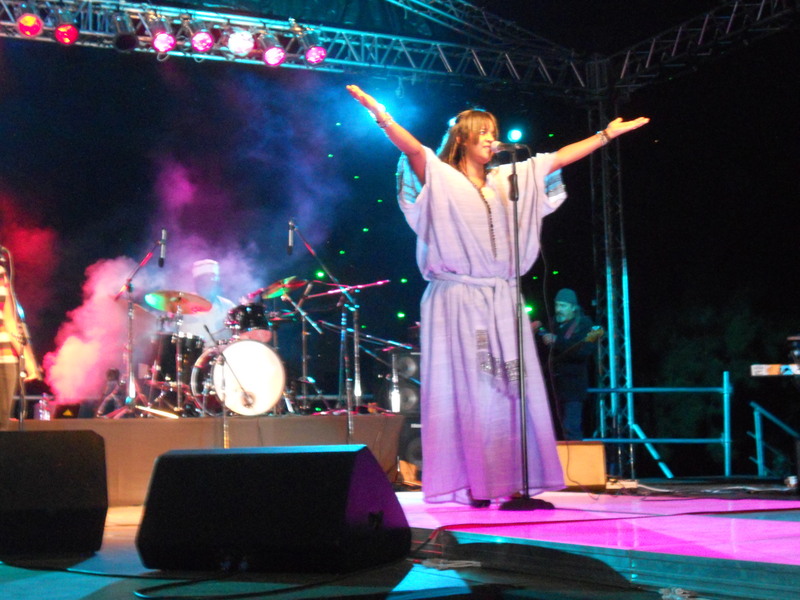 Having long been a fan of Ethiopian cuisine, I was very excited to be spending a week in that country’s capital of Addis Ababa, where I was filming a concert by my good friend, Ethiopian songstress GiGi, who was returning to her native land after a 14-year hiatus. 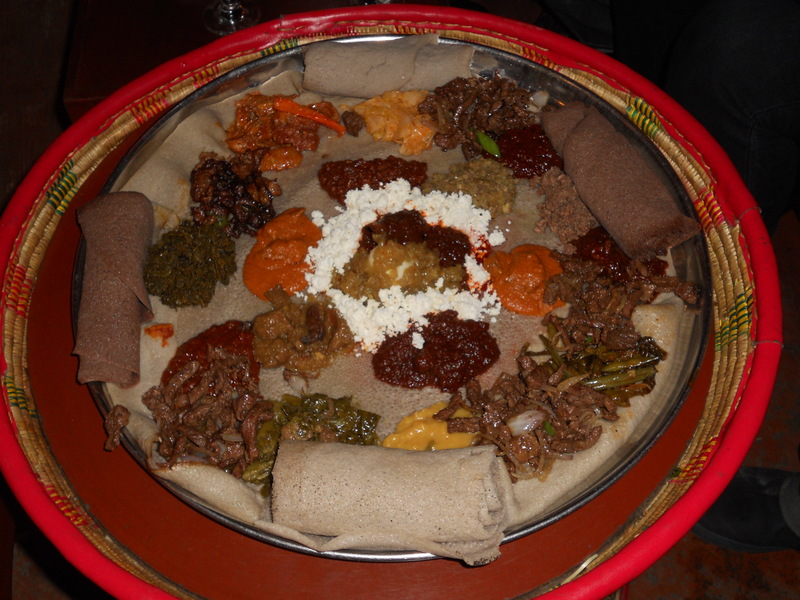 My anticipation of the concert was almost dwarfed by the prospect of being able to sample the broad range of authentic Ethiopian cuisine in the Motherland itself—an experience on par with eating world-renowned Kobe beef in Kobe, Japan. 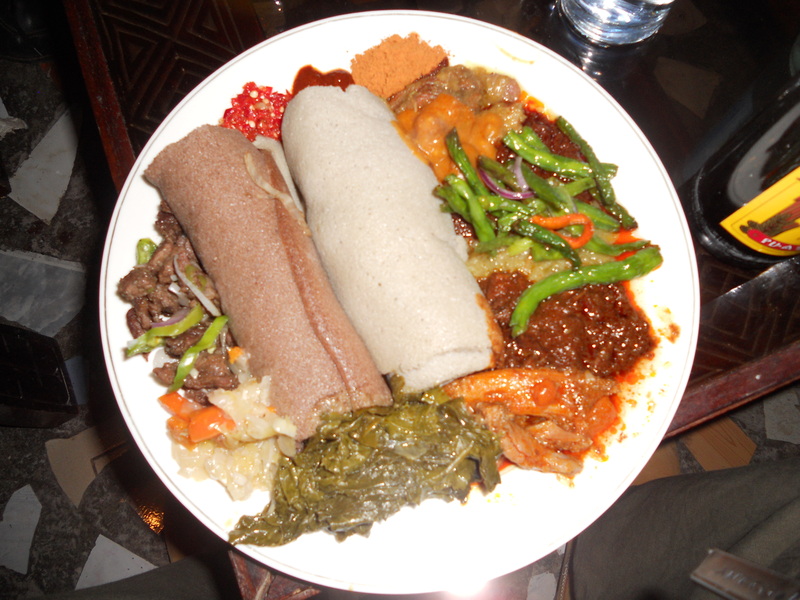 Not that I expected the food to be radically different from what I had eaten In Ethiopian restaurants in Baltimore and DC, but I had heard, for example, that injera, the staple, pancake-like sourdough bread usually made of teff flour is more commonly made with wheat flour in the States. Teff, a grain native to Northeastern Africa, packs a very high nutritional punch and contains far less gluten than wheat. 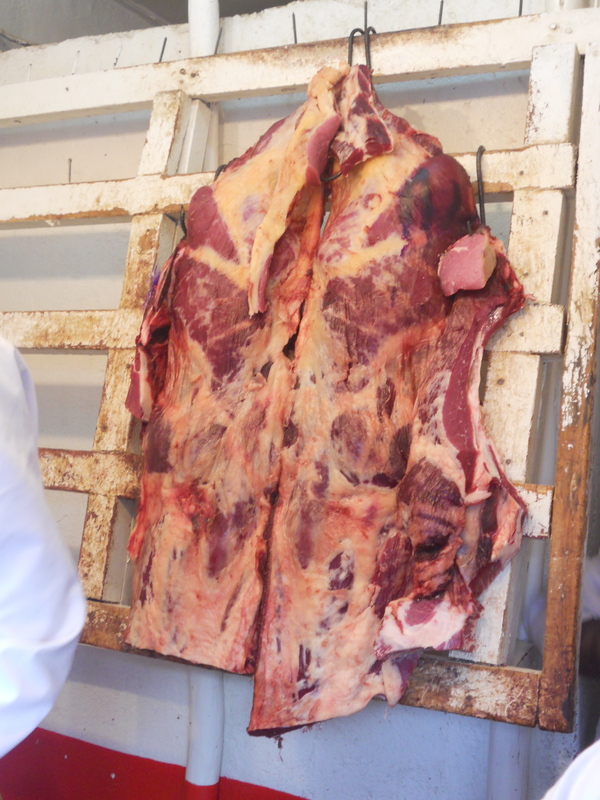 I was also looking forward to trying such specialties as tere sega, or raw meat, as well as drinking coffee in the land where it supposedly originated. We arrived in Addis on a bright, sunny 70-degree morning following the 12-hour direct flight from DC. With hunger pangs buzzing, I decided to try the complimentary breakfast at our hotel, The Intercontinental Addis, where they had put up quite a spread of Western and Ethiopian food. 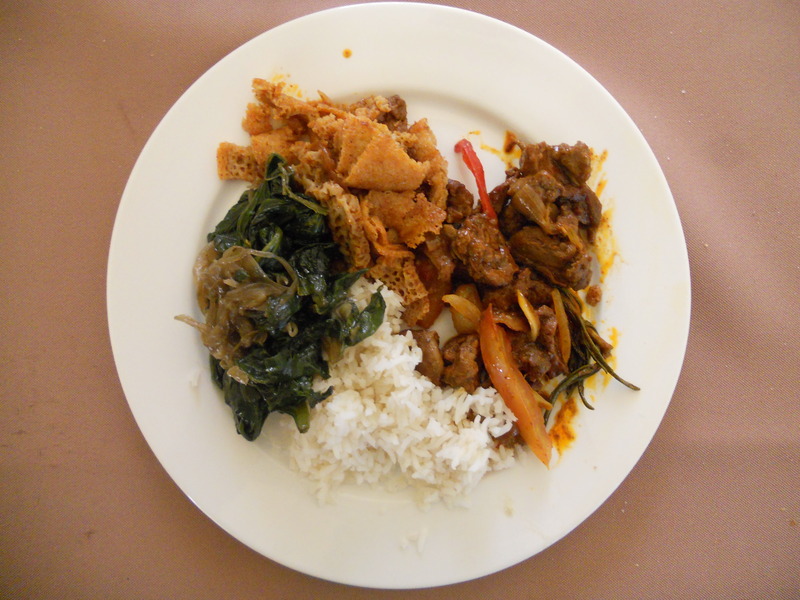 I, of course, opted for the latter filling my plate with firfir (torn up bits of injera mixed with butter and berbere spice), kai wat (beef cooked in berebere), gomen (minced spinach), sils (a hot tomato and onion sauce), and coconut rice. I’m not sure the rice was a native dish, since I only ever saw it at the hotel, but one ingredient that is distinctly Ethiopian is the spice mixture known as berbere. As many as 16 different spices go into berbere, including chili powder, cardamom, clove, fenugreek, cinnamon, turmeric, and allspice, but like curry powder, everyone has their own special blend. was the only thing on the communal plate that I did not really take a liking too. There was also a selection of vegetarian dishes—called ye som megeb–including sautéed collard greens, cabbage, and green beans, and a spicy dipping sauce called awazi. In addition to the injera, which had a remarkable sour taste and far superior to any I’ve had stateside, there was a flatbread made of darker flour, whose name unfortunately escapes me right now. 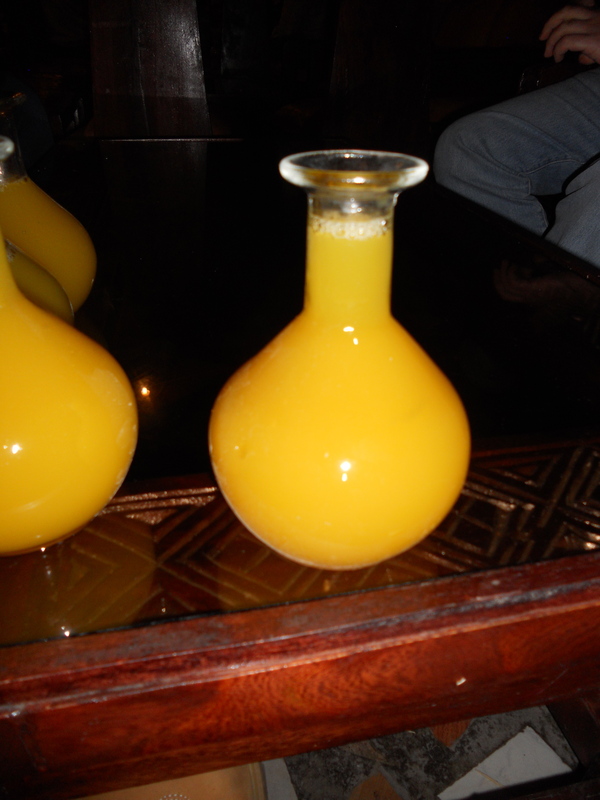 The extra strong Ethiopian honey wine, tej, is definitely an acquired taste, so I washed it all down with the popular Ethiopian beer, St. George. 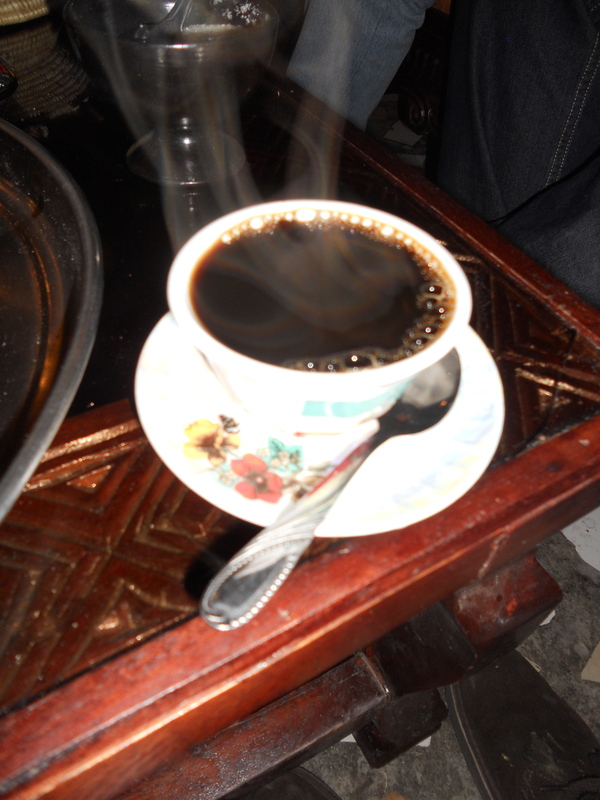 Intense, black Ethiopian coffee was served after the meal accompanied by bekolo (popcorn) and a smoking dish of frankincense for effect. 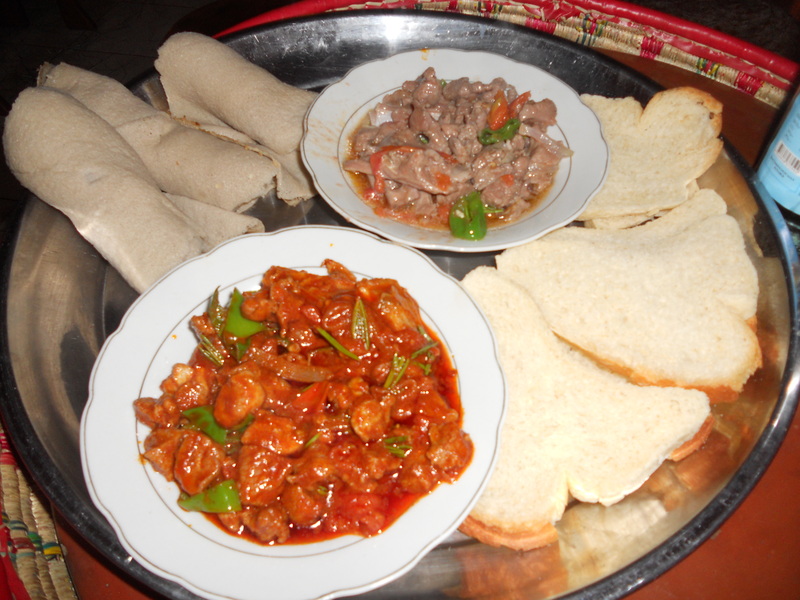 This first night’s extravagant menu was the blueprint for every subsequent meal I was to have in Ethiopia with the injera providing both the roughage and a utensil by which to pick up and eat the various dishes. 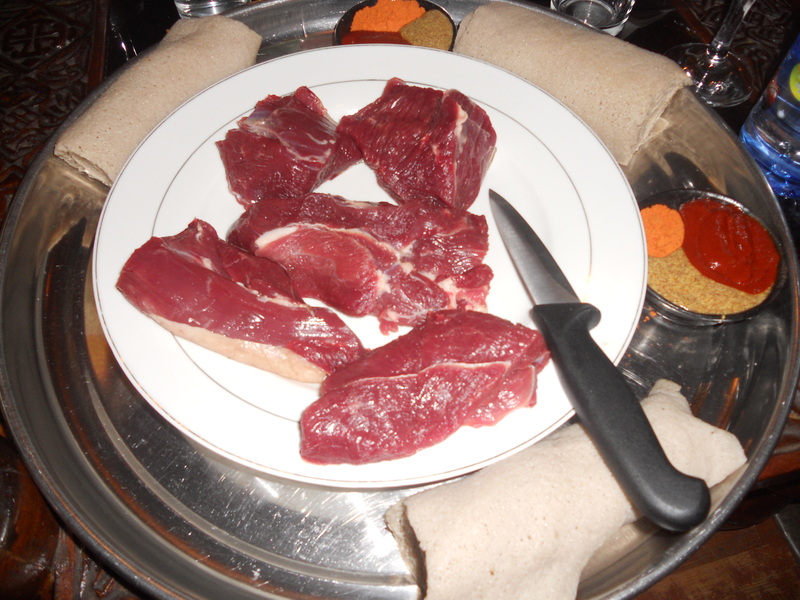 On the adventurous side, I also sampled trippa (tripe), which tasted kind of ‘funky’ and finally tere sega or raw meat. I was expecting beef or ox, but was served raw goat meat instead, which surprisingly lacked any taste, gamey or otherwise. 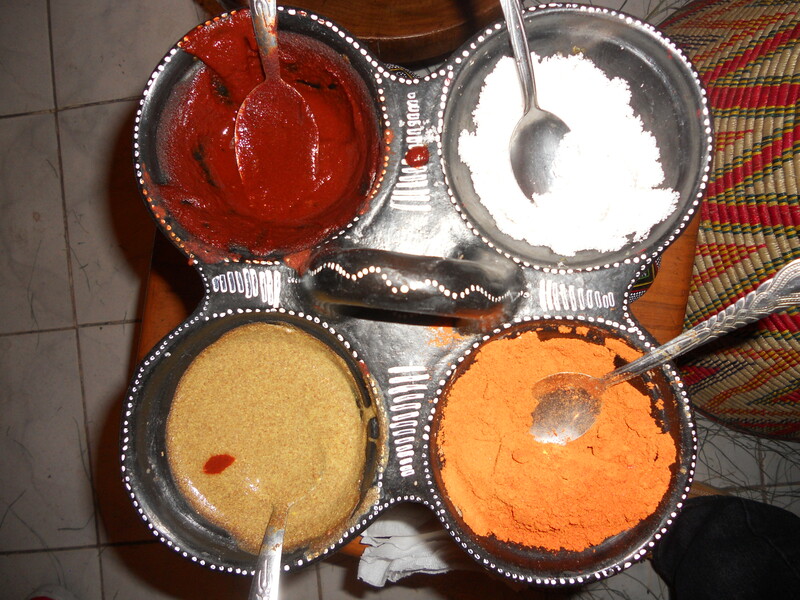 It came with several dipping sauces including a spicy mustard (senafich), and a spicy reddish powder similar to berbere called mitimita. Texturally it was very similar to sushi, and while even cooked goat is known to be somewhat tough (unless it is cooked for a very long time), this raw goat was pretty tender. you get to travel an amazing amount! I was on the road for 2 years in Asia and I really miss that lifestyle. I just googled awazi and found this post. my parents’ neighbour gave me a selection of ethiopian spices and a jar of awazi, and I’m trying to figure out what to make. You’ve given me plenty of ideas!